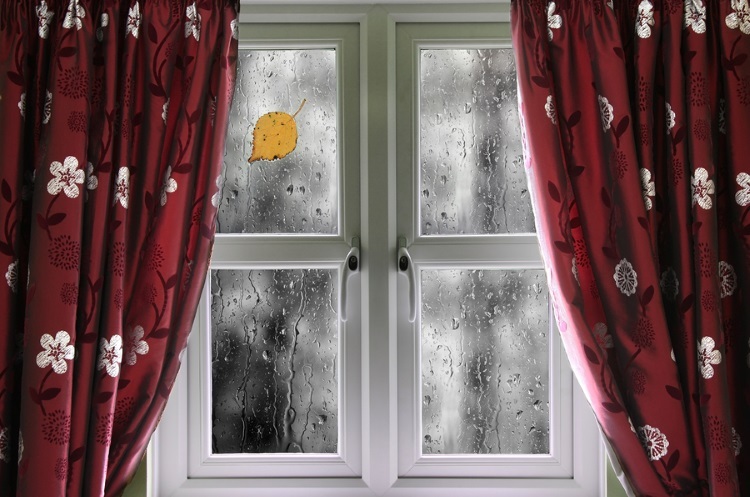 The first thing to do if you think you have condensation in your home is to diagnose the causes of damp to see if it is condensation or another damp problem. Many people think they have rising damp or a leak, where in fact they just have condensation in their home. When the water vapour in warm, moist air hits a cold surface it causes the water to ‘condense’ onto that cold surface – you will have noticed this phenomenon on a cold bottle on a hot day. Warm, moist air in the home, caused by washing, cooking, bathing, and even breathing, can deposit a huge amount of water onto cold spots in a room, and this makes a breeding ground for black moulds which may be harmful to health. In this article we teach you how to diagnose condensation and remove the conditions that cause it. You are most likely to see water running down your windows, or black mould in the corner of a room if you have a condensation problem. This is most noticeable in the mornings after a night of warm air hitting a cold window, especially if you sleep with the window closed. Where the symptoms above are ignored, and no action is taken, then these moist conditions are ideal breeding grounds for black mould. Especially if the windows have damaged paintwork, which allows mould spores to settle in cracks, making them difficult to easily wipe away. 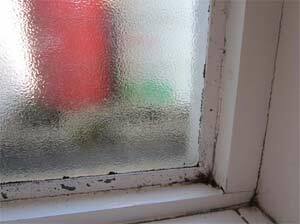 These black mould patches are particularly likely to form in corners and recesses with little airflow. Built-in cupboards can attract condensation, especially if they are built against an external wall. The lack of ventilation in these areas allows black mould spores to settle and develop. By this we mean inside the house but on a wall that is likely to be cooler because it faces the outside. You are most likely to spot this in steamy rooms like kitchens and bathrooms. Over time the condensation that starts off as beads of water can soak into the décor and the fabric of your walls, causing a more pronounced damp patch. This often makes people think they have a leak. Corners of rooms have less airflow, which can hold the moist air in place until it cools enough to deposit the moisture onto the surface. Again, this is most common in the corners of rooms, where there is less ventilation, and especially where they are colder than the rest of the room. If you have really high humidity in your house, you might find that water condenses onto internal walls, as well as your external walls. Black mould may appear on the linings of curtains where windows show signs of condensation and on clothes in cupboards (see 4 above). If you spot black mould on your carpets this can be a symptom of condensation, but is more often a sign of penetrating damp, especially if you don’t have any of the symptoms above. The most effective way to control and prevent condensation is to alter your lifestyle. Ventilation is key, but you can also avoid creating warm moist air in your home too. Make sure you change the air in your house at least once a day. Open windows at both ends of the house for at least 20 minutes. Don’t block up chimneys if you have them. Open a window if possible when you are cooking, ironing, or having a shower or bath. These are small vents installed into window frames. UPVC windows usually have these fitted as a matter of course. If you have trickle vents fitted, make sure you leave them open. Make sure you use your bathroom fan while you are having a bath or showering. Use your kitchen extractor fan when you are cooking too. Wherever possible avoid drying clothes on radiators or clothes’ airers indoors. If you have a tumble dryer make sure it is properly vented. If you are buying a new tumble dryer consider a self-condensing model (see this handy explanation of condenser dryers on KnowHow.com). This is a short-term measure to quickly dry out an area that is very wet. Once done, make sure you implement the changes suggested above to prevent reoccurrence of the problem. Industrial dehumidifiers can be hired, if you have a short term issue such as after building works. You can buy a domestic dehumidifier if you think you will need to use it more frequently. Consumer magazine Which? has a useful guide on choosing a dehumidifier. Special crystals or salt blocks remove moisture from the air and trap it into a container. These humidity absorbers are a low cost solution for small areas affected by condensation and can be placed on windowsills or in cupboards if the other measures do not totally cure your problem. If you just have occasional problems with condensation – for instance when cooking Sunday lunch or having lots of visitors to stay, you can simply wipe up the water to prevent it causing damage. This device will to help you monitor the humidity in your home. You are aiming for a level between 55-65% for the best environment for comfortable living. These can be purchased online or hired. Cold spots could be caused by building defects such as failing wall ties, or faulty insulation. Hire an infra-red thermometer to find any cold spots, so that you can investigate to check if you have structural issues. Test walls and floors with a damp meter to check you don’t have any leaks. 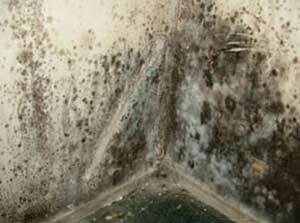 Wash down any surfaces that have been affected by black mould growth with anti-mould cleaner prior to redecoration. Use anti mould paint – available from Ronseal and other paint manufacturers, or mix in anti-mould additive to your chosen paint. These are available online or from most supermarkets. 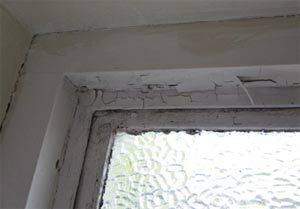 If you want to find out more about causes, diagnosis and how to treat the damage caused by condensation, including removing black sooty mould, treating stains and damp patches, and what products help avoid condensation, please head over to the Condensation Project on DIY Doctor for more advice and information. This post was written for the Hunters Blog by DIY Doctor.